Set out on Adirondack snowmobile trails for a day of fun! The Adirondacks are full of trail systems, clubs, and tours that cater to this thrilling winter sport. To help you determine where to go this winter season for a snowmobile tour of the Adirondacks, we've gathered the most useful resources and discovered the best areas for snowmobiling. If you're an experienced snowmobiler, then you can enjoy excursions on your own or with friends. However, if you're a beginner, then you may want to take a guided snowmobile tour. When you're ready to start planning your trip, then you should visit SnowmobileTrail.com. This website features a map in which you can zoom in on the Adirondack Park and see where the snowmobile trails are. In addition, we've compiled a list of a few popular areas for snowmobiling in a wide range of counties in and around the Adirondacks. Take a look and find a place to go on a snowmobiling adventure this winter! Description: A large system of interconnecting snowmobile trail systems, both groomed and un-groomed. Maintained by multiple local snowmobile clubs. The Saranac Lake and Lake Placid area is a popular winter destination for snowmobilers and outdoor enthusiasts of all kinds. See a list of Franklin County snowmobile clubs. Description: Considered a snowmobiler's paradise, Hamilton County has roughly 700 miles of interconnecting snowmobile trail systems between the Moose River Plains, Indian Lake, Inlet, Long Lake, as well as Old Forge in Herkimer County. See a list of Hamilton County snowmobile clubs. Description: Access to miles of interconnecting snowmobile trail systems, both groomed and ungroomed. On some, you'll find yourself traveling parallel to Lake Champlain. 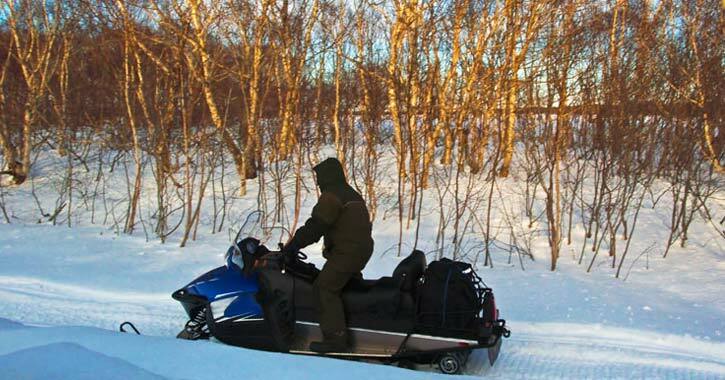 See a list of Essex County snowmobile clubs. Description: Over 100 miles of trails connect to Lake George, Lake Luzerne, Queensbury, and Glens Falls. Many of these trails are groomed during the season. See a list of Warren County snowmobile clubs. Description: Fulton County's 150 miles of groomed snowmobile trails link the Mohawk Valley to the Adirondack Mountains. See a list of Fulton County snowmobile clubs. Description: The county has multiple snowmobile clubs that maintain interconnecting trails. More than 80% of the snowmobile trails in Washington County are on private land; it is due to the generosity of these landowners that these trails exist! See a list of Washington County snowmobile clubs. Description: Access to miles of interconnecting snowmobile trail systems, both groomed and un-groomed, just outside and around Saratoga Springs. See a list of Saratoga County snowmobile clubs. NOTE: Each trail has a different open date based on the hunting season in that area. By mid-December all trails will be open for use if snow conditions allow for snowmobiling. Call a local snowmobile club for more information about dates.